I've been blogging for so long now that I sometimes forget whether or not I have posted a specific recipe, especially if it is one that I have had for a long time. And I have had this one for a very long time, indeed. I got it from my co-worker and boss in a two-person office when I worked for the League of Women Voters in Austin - the only job from which I have fired myself. I enjoyed working there, but it got routine after a while and I was bored, so I started going in later and later, and wasting more and more time while I was there, although how I do not remember since there was no internet at the time. We were high tech, though, for the times. We even had a word processor! 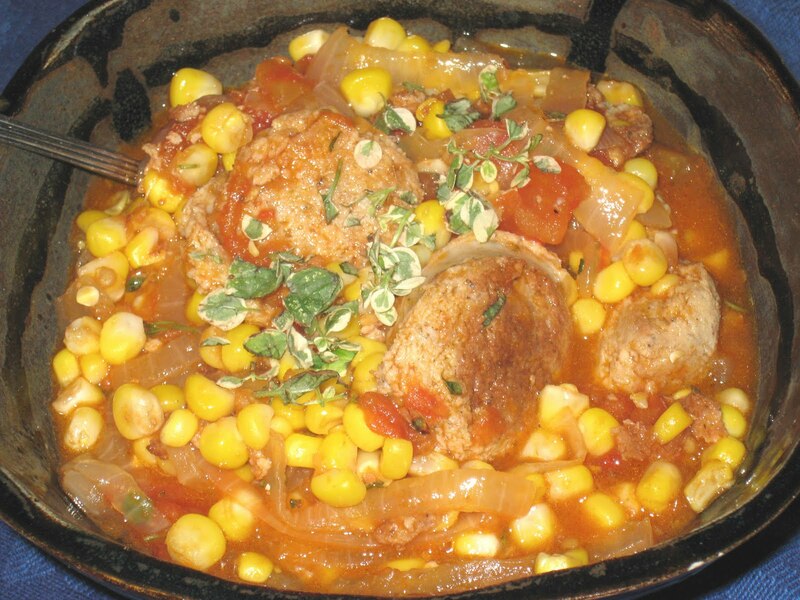 I have been looking for different things to do with this summer's abundance of corn and tomatoes, and this recipe came to mind. I decided it could be lightened up if I found a different kind of sausage to use. 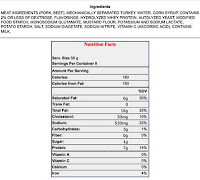 The rest of the ingredients are quite healthy, so I figured it should not be too hard to make that one change. The Apple Market, where I buy the majority of my meat, recently added chicken sausage to their rotation. 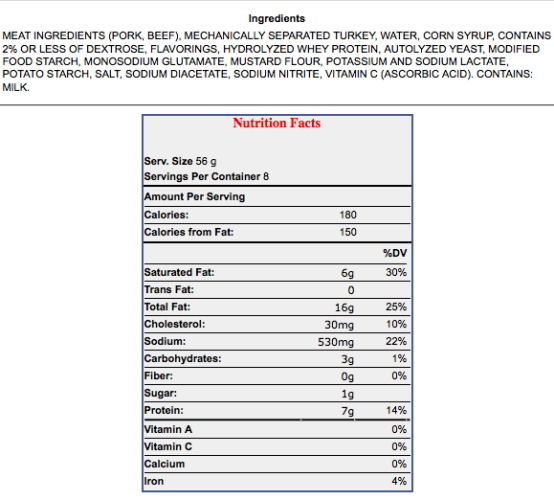 I had used it before with my Sweet and Sour Cabbage Soup, so I knew it tasted good, and is quite lean compared to the Eckrich sausage. It worked beautifully. And with fresh corn and tomatoes, the whole dish is lighter and fresher, and much better than the original. A few tablespoons of chopped fresh oregano that my co-worker was generous enough to give me (again!) made it even better. Heat a scant tablespoon of oil in a large skillet over medium-high heat. Add one pound of chicken or turkey sausage (it will need the oil to get started, since it does not have a lot of fat), sliced into 1/2-inch rounds, and let it brown well on both sides. 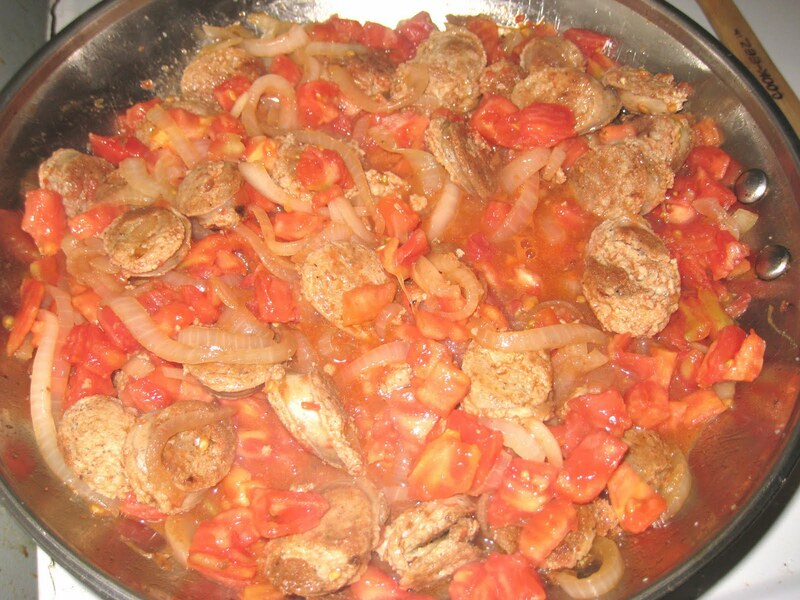 While the sausage is browning, cut a large onion in half lengthwise and slice into thin half-rings. 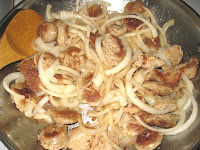 Once the sausage is browned (Make sure it is well browned), add the onions and a handful of salt and, lowering the heat if necessary, cook until the onions are soft and translucent. While the onions are cooking, peel 2 large or 3 medium tomatoes and chop them roughly. You do not have to take out the seeds. Once the onions are translucent, add the tomatoes and stir well, making sure to pick up any of the brown bits on the bottom of the skillet that were not picked up by the onion. Bring to a boil, then lower the heat and cover. Cook for 20 minutes. Add 3-1/2 cups of blanched corn and cook until the corn is heated through, about 10 more minutes. Remove from the heat and, if desired, add 3 tablespoons of fresh chopped oregano (or herb of choice) just before serving. This dish should serve 4. If my experience is any indication, there won't be any leftovers. I am going to try making smoked sausage before we put the smoker away for the season. I will let you know how it works out. What fun - that sounds wonderful! I have been thinking about making my own non-smoked sausage for a while now. Not links, just bulk. I look forward to hearing how it turns out. And seeing, too (hint, hint)! If it turns out I will make sure to put some aside for you. We need to get together soon. Yes, we do. I'll email you and we can make a plan.